Following yesterday’s announcement this is the official giveaway for the South Korean movie 71-Into the Fire. Here’s what it’s all about. On August 11th, 1950, 71 boy soldiers of the South Korean army singlehandedly held back the elite North Korean 766 Commando Brigade for a full 11 hours. Most were still in their school uniforms and had only fired a single bullet in training! Their astonishing bravery under fire enabled allied forces to hold a strategic bridgehead at the Nakdong River and gain a tactical advantage that would help turn the tide of the entire war. Nothing less than the freedom of their nation was at stake. Their ingenuity, tenacity and brotherhood helped them to achieve the impossible. As I said yesterday this giveaway is courtesy of the distributor cine-asia. I’m giving away 2 DVD’s (region 2) of the movie 71-Into the fire. To enter, simply leave a comment with your e-mail address and let me know why you would like to have this DVD. Should there be a lot of interested people the first one to leave a comment will get one, the second will be drawn from the remaining names. The giveaway finishes Thursday 31 March. The winners will be announced on April 1st. 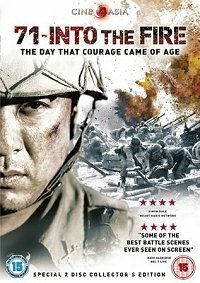 This entry was posted in Giveaway, History, Infantry Combat, Korean War, Movie, Reviews, Trailer, True Story, War Movie and tagged 71 Into the Fire, Cine-Asia, Giveaway, History, Infantry Combat, Korean War, Movies, Pohwasogeuro, South Korean war movie, True Story, War Movie. Here are two reasons I deserve consideration. First, this incident is eerily similar to an incident in the American Civil War involving cadets from Virginia Military Institute during a Shenandoah Valley campaign in 1864. It is also reminiscent of Los Ninos in the Battle of Chapultepec in the Mexican War. It is amazing that at least three countries have “cadets going into battle” legends. Second, March 31 is my birthday, just saying. I will glady congratulate you as my first winner as you are not only the first to leave a comment ( which was a rule) but also giving great reasons. Is the region coding no problem for you at all? I know the US usually can only watch region 1. If it doesn’t matter, well then: congratulations. I have no idea what this coding stuff is. I certainly do not want to take one of the copies if I can not watch it…. I just looked it up and it looks like my DVD player would spit it out so thank you, but you need to find someone else. I can not move to Europe just for this movie. I thought so, I asked her especially to make sure. I have a region coding free DVD player and have been told that the same are available in the US too but when you have one that is coded then it doesn’t work. Japanese DVD also has region 2 and I have 3 DVD from Japan that can easily be played here 🙂 . My country is actually Region 3. All those you have posted were great,I’d love to see the whole movie. According to my rules you just won a DVD. 🙂 The second winner will have to wait for his name to be drawn by me on Thursday evening and announced on Friday. I’m actually amazed that not more people entered so far. I have 300 – 400 visitors per day on this blog. Odd. I would like to win this DVD because if I won, I would randomly choose a person out of a small group of bloggers who I respect and would ask you to send it to their part of the globe instead as a gift! Congratulations Novroz on your win! Views are often misleading, 300 views sometime only lead to people who passed by. I know…I ‘ll tell castor from anomalous material and maybe he can spread the word. Yes, you are right but I know they do not just pass by as I see how many links and translations are clicked and I get e-mails. I think however, because they mostly come in through search terms, they will not always go to the beginning of the blog and simply not see it. They read the articles they are interested in. And there is also the possibility that people simply do not want to get this DVD. I suggest it might be a region code thing. I would have entered otherwise! Maybe that is the reason, you are right. There is unfortunately not much I can do. I don’t understand this coding anyway. Why do they have to do this? I’m not sure that it is a region code issue, because there is a large portion of the world who can use the Region 2 – Unless mainly Region 1 (etc) areas access this blog? Maybe people want to stay anonymous? The DVD has arrived 🙂 I will watch it somewhere this week and make a review out of it. I will not be able to watch before the weekend and post earliest on Sunday. You don’t need to wait for me just go ahead. I’ll just link you later. But I won’t posting my review till Wednesday. Oh, that’s good news! I watched it today and will also post on Wednesday!